Austell, GA – March 2018 – What happened when the Georgia Manufacturing Alliance (GMA) and FSI offer a fulfillment center tour? 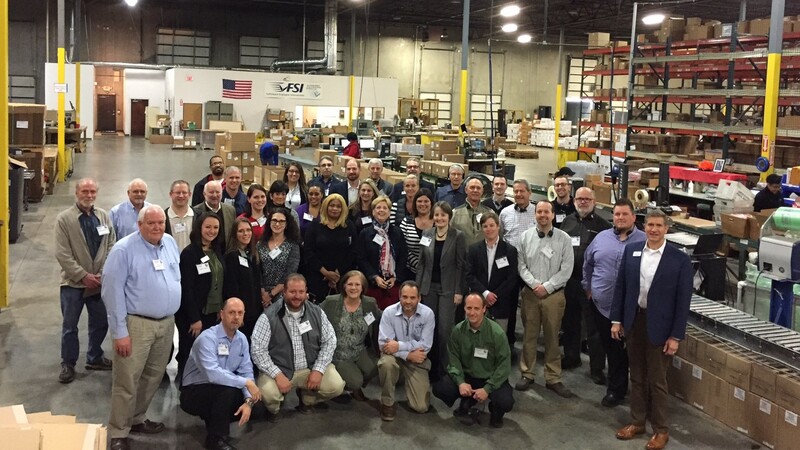 Forty-six professionals in many industries from across Georgia met to gain a better understanding of how a fulfillment center serves clients. The tour started by sharing the story of how Ken Marbutt came from leading a fulfillment division in the printing industry. He saw the need to help clients fulfill their orders and combine technology with the logistics. As Ken knew early on, fulfillment isn't about just stocking, packing, and shipping boxes, it's thinking far outside of them. Ken created an atmosphere where people can thrive along with using technology would play a key role in his company’s success. So, on April 1996, FSI was started in a 16,000 square foot facility in Fulton County. Over the next 22 years, that vision is being realized. FSI has grown to have over 290,000 square feet of warehouse space, and pick/pack/ship millions of items for hundreds of clients across the globe with some of the original employees. Ken's vision for FSI is carried forward today by his son, Forrest Marbutt, Vice President & GM, working alongside a dedicated staff and management team. The tour through the main facility highlighted what it takes to manage a huge inventory and fulfill both e-commerce and retail orders. The GMA witnessed the packing of e-commerce orders for direct shipment to consumers, as well as the freighting of larger orders for big-box or small retailers. The use of bar-coding technology and processes were highlighted as this helps FSI not only with order efficiency, but also order accuracy rates as defined across several key metrics. We completed the tour in the production area where projects are being assembled and watched new automated order processing equipment in action. Marjorie Dykes, the GMA Marketing Director, wrapped up the tour by asking attendees for a few memorable moments. Overwhelming, the responses centered on how friendly everyone was to each other and how management knew each employee’s name within the organization. A fitting tribute to the FSI’s beginnings. If you’d like to grow your business, let’s talk. We’d enjoy hearing your story and seeing if FSI can be a part of your vision. Call 678-391-5980 or email sales@fsifulfillment.com.